The Sacramento River is one of the Mount Shasta area’s great landmarks. It begins high in the Trinity Divide, rising as three forks that originate from beautiful alpine lakes and expansive, lush meadows. 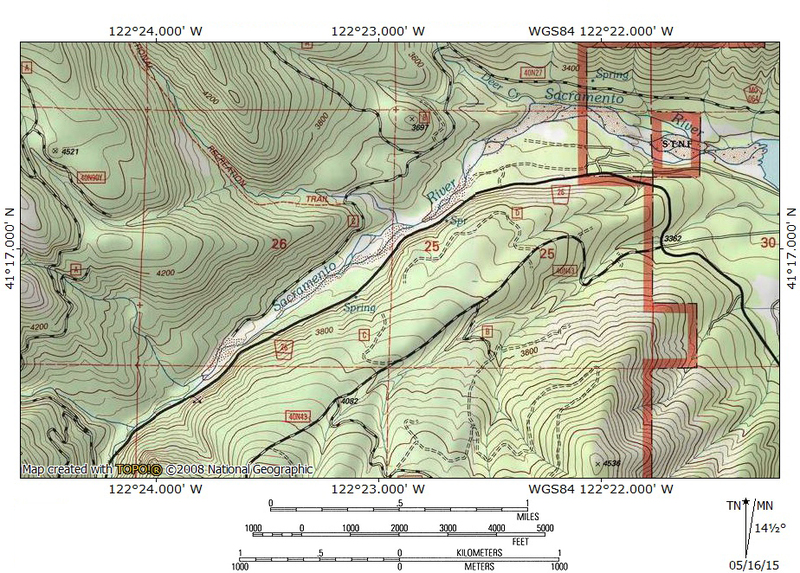 The three forks course energetically through deep canyons before combining into the main stem of the Sacramento, just upstream from the Box Canyon Dam and Lake Siskiyou. When the forks emerge from their canyons, the river flows through a broad valley with ridges lower than the ones that line the headwater canyons. Here the river’s flood plain widens significantly, revealing a vast field of multi-colored river rock. The river charges through the rocky way, pouring over, through and around the rocks that litter its path. Here the Sacramento’s essential character is kinetic and the river manages to at once refresh and energize visitors. I grew up visiting Yosemite many times per year, for extended periods of time. Since the 1960’s, my family had been staying in the park’s Housekeeping Camp, an extension of famed Camp Curry, where cabins were constructed of concrete walls, canvas roofs and wooden plank fences. The camp is situated on a bend in the Merced River and many of the cabins are located right next to the river. Nowadays much of the riverfront area is fenced off and restoration efforts have allowed the banks to revegitate. This was not the case when I was a kid and the longest stretch of Housekeeping’s riverfront was several hundred yards of large boulders that functioned as riprap near the cabins. As a child, my brother and I would charge up and down the length of this section of river, jumping from one large boulder to the next as fast as possible. This was the earliest memory I have of loving to scramble on rocks and over granite. I still love to do this and it is for this reason that the newly formed Sacramento, just downstream from the confluence of the South and Middle Forks is a place that I am particularly fond of. It is here that I am able to indulge once again in the pleasure of scrambling over stones in the presence of a beautiful river. 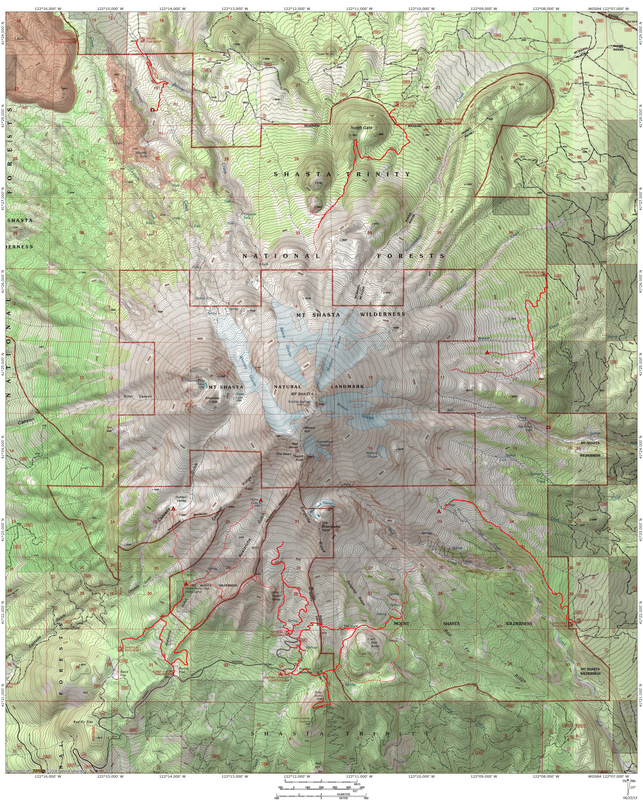 Between the confluence of the South and Middle Forks and the inlet into Lake Siskiyou, it is possible to find many spots with plenty of opportunities to enjoy scrambling on the rocks. Nearer to the confluence, the river channel is narrower but there are still plenty of huge rocks to enjoy and small swimming holes to cool off in. Further downstream, as the Sacramento approaches the North Fork, the channel widens and the river rock consists of vast, unbroken fields of boulders, cut by the churning water of the river. Enjoying the beautiful, multi-colored rocks and the lovely river is made all the easier by the presence of Mount Shasta, visible beyond the river in many places. It is easy to pick a spot from which to enjoy the river. 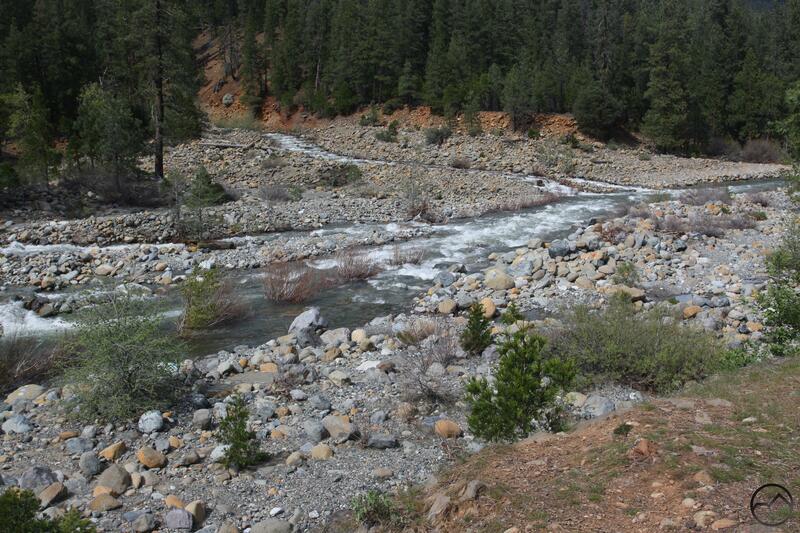 Almost anywhere on South Fork Road, once it has crossed into the Shasta-Trinity National Forest, will offer access to a good spot next to the water. Some spots closer to Lake Siskiyou have cliffs on the south side, so getting down to the river can be a bit challenging but most of the area where the road and river run parallel has an easy approach to the water. Many spots on the river have unofficial campsites, where it is possible to pitch a tent just above the water or only a stones through away. 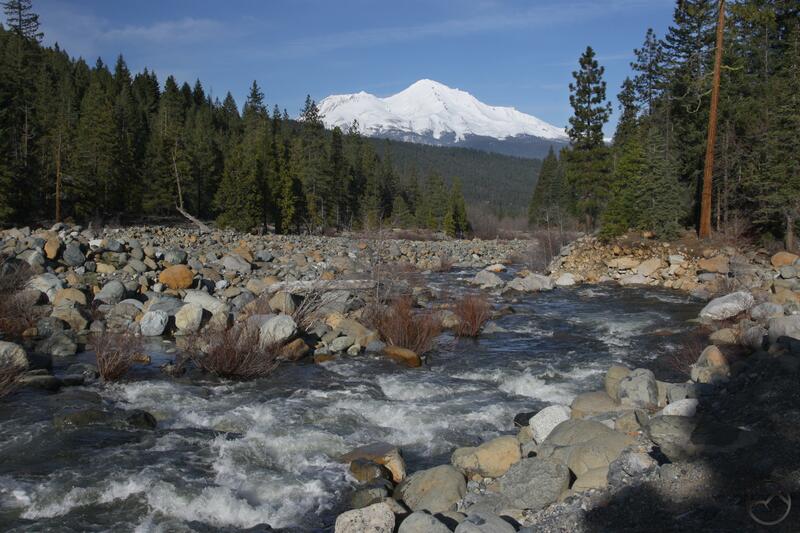 A couple of these sites are even blessed with incredible views of Mount Shasta, its mighty cone towering above the river. There are no trails along this section of the Sacramento River and scrambling over the rocks is the only way to enjoy the raucous beauty. However, scrambling over rocks next to a beautiful river is one of the great joys of being in the mountains and the Sacramento River has one of the best scrambling areas around. It is a special place, whether you are bringing kids who are sure to have fun climbing on the rocks or you are in search of a place conducive to great contemplation. Whatever the reason, just be sure to visit the Sacramento and enjoy one of the great treats of the Mount Shasta area. The Sacramento River, just upstream from the former split. Scrambling over rocks is a great way to introduce kids to the joy of being in the outdoors, too. Absolutely. It was quite formative for me and it has been so far for my kids too. They love it whenever we go to the river.